But "hands wide open" isn't a one-sided concept. If when God opens His hand, I am filled (Psalm 104), then I had to hold open my hand to receive. Think of the beggars in the gospel, sitting with open hand just waiting for someone to put something good into their hand so that they can survive another day. Am I not a beggar? In need of God's kind gift. Possessions. A house. Earth stuff. It means holding lightly all things. But it goes beyond stuff. To people. Friends and family. It may mean saying goodbye to go live in a new place, another country even. I've said many goodbyes. And though you hope to keep in touch, near proximity almost always trumps and the divide is not fully bridged by email or Facebook or even Skype or FaceTime. We can each really only pour ourselves into a limited number of people. It doesn't mean we don't love the people God has knit our hearts to in previous places. We look forward to picking up where we left off, some day. But it may go still deeper. To our own children. And soul-searchingly deeper. In death. The death of a loved one. A child. A child yet unborn. "It's okay, Michelle, I have her." I remember the Spirit's whisper. I remember the strong wind leaving the doctor's office after finding out my little girl was gone. It is painful. But there is grace enough, somehow. Can I open my hand? Will I? "The Lord gives and the Lord takes away," Job proclaims. And then chooses praise: "Blessed be the name of the LORD." Can I choose to take what God gives and give thanks? And I'm reminded again of one thousand gifts. JOB knew "hands wide open" could be painful. Lonely. Gut-wrenching and completely confusing. God knows what "hands wide open" means. God Who opened His hand to give us His Son. Jesus Who "did not count equality with God a thing to be grasped" (Philippians 2:6, ESV). Jesus, God the Son, Who stretched His hands wide open for nails to hammered through them, to bear the weight of sin for us, literally to become sin for us and bear the wrath of the Father. He knows. He knows that anything given up is for greater gain. He died for the hope of relationship with each of us. And He rewards. Job's end was better than his beginning (Job 42). See Chris Koelle's vimeo trailer of the new release JOB the film. "Hands wide open" means that God can open His hand and fill my empty, open hands. In His time ("in due season"). In His way. "Hands wide open" means one thing more. It means praise. And I am learning the humility and grace of "hands wide open" in worship. My grandmother, who began her married life as a missionary in Kentucky, puts it this way: "If the Spirit tells me to raise my hands, I'd be sinning not to." And so I ask, are my "hands wide open" today? If not, what is it--or who is it--that I am grasping on to? Unclenching my fist, prying open my fingers is the first necessary step. Am I stretching out my hands, ready for God to fill and satisfy how He sees fit? 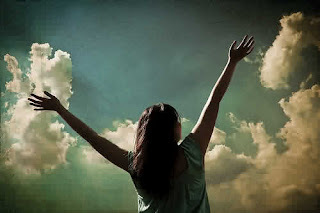 Am I raising my hands to worship the God Who opened His hands wide open for me? And am I then reaching out my hands to those around me who are poor and needy, sharing the good gifts God pours into my open hands?